Now, these aren’t really garden photos, but they do illustrate an important vantage point that we see from the garden. 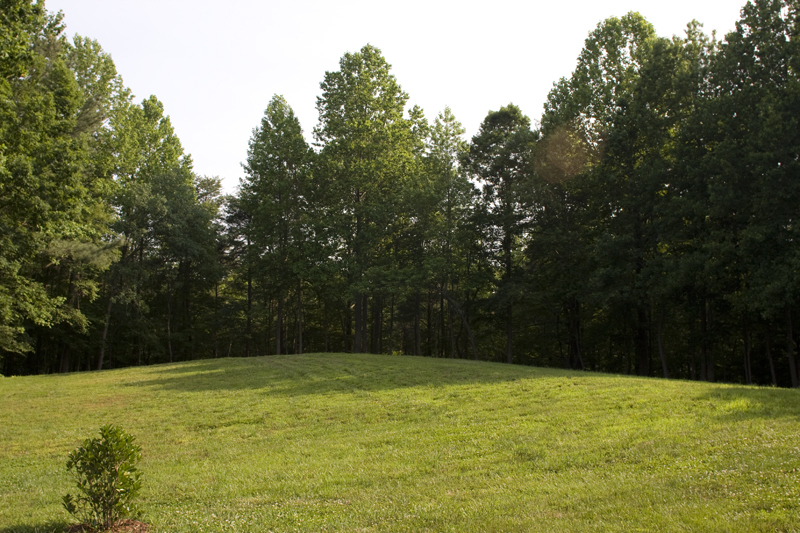 The first photo is looking from our back yard into what we call the Back Forty. The Back Forty is a sort of weedy, semi-wilderness area that we keep cut so that the wild critters won’t feel too welcome to wander close to where we have little dogs, a cat and chickens milling about. As you can see, it’s not very pretty and it’s not very inspiring. The undergrowth is out of control and you can’t even see the trees for the forest, so to speak. It’s a wall of green. After having done some clearing for our fledgling woodland garden (scroll down to the bottom of the post to see a photo) I decided we needed more of the same. The hearty tree guys spent the better part of two days limbing up trees, clearing brush and generally tidying the area. It’s still a blank slate, but at least now it’s a tidy blank slate and we can see the trees. Next step: Figure out the next step. Ah, January. I have created a new folder in Photoshop Bridge entitled Garden 2011. 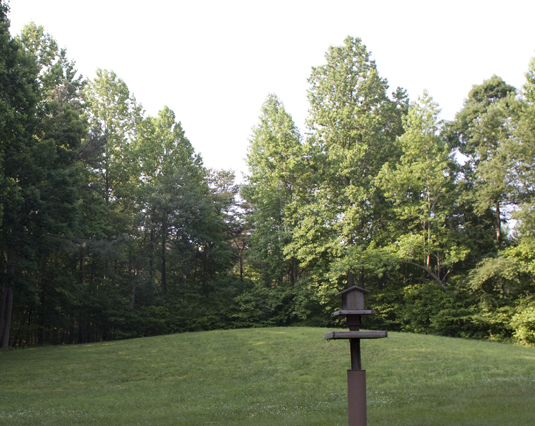 I have one single photo in it, but it’s an important one—a shot of where we’ll be creating a woodland garden. Out of necessity came opportunity. We had the local tree guys out to take down a large tulip tree that was in imminent danger of falling onto the chicken coop and across the driveway. It was a tricky undertaking because of its location. The older of the father/son pair is in his 60s, but you wouldn’t know it by the way he scampered up that tree. Starting at the top he sawed off limbs and then he topped it. I was in the house when the top 10 feet of the tree came down. There was a huge crash, which I would have been worried about except I heard the two men erupt into whoops of glee. Isn’t it great to take joy in your work? Anyway, the rest of the tree came down, as did another in the way. I will also have to move a lot of the hostas I planted there in the past two years since they will now likely scorch in the sun. I’m not showing you photos of it all because the whole process made a humongous mess that I will have to deal with when the thermometer climbs above freezing. While the tree guys were here they made me a good deal offer to clear some of the woods. I hopped on the chance to get this section of the woods cleared of underbrush and trash trees. It is the area near the house that we look on when we eat dinner outside in the summer. 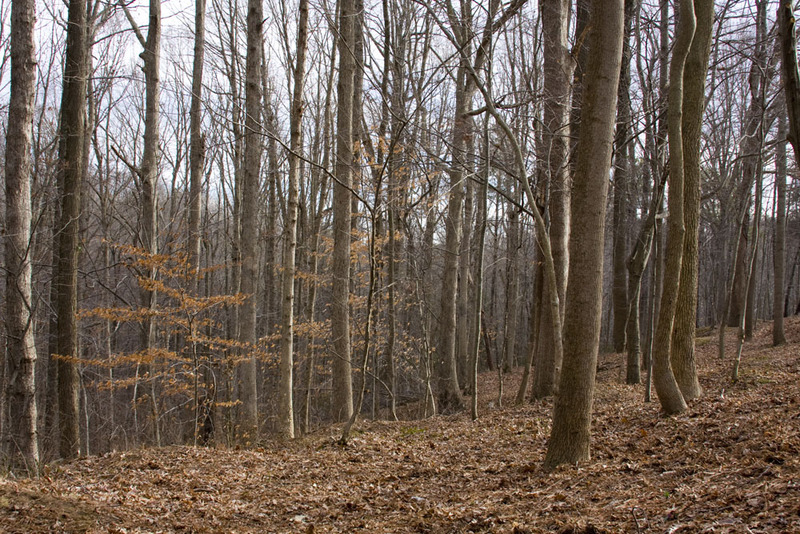 Without all the tangle of underbrush and trash trees, we’ll get a better view into the woods. We’ll also put in a path and a bench to overlook a ravine that you can’t see very well in the photo. Whatever else goes in the woodland garden, I am determined that it will be low maintenance. We already have a healthy crop of moss. I like moss. Some of the hostas will also find a new home there. Then there will be bulbs. And a hammock. And my bottle tree. So here you have it, the first view of the new woodland garden.